WBC featherweight champion, Gary Russell Jr. is coming off of the second defense of his belt, scoring an impressive seventh round knockout over tough challenger, Oscar Escandon. The fight took place in Russell Jr’s home state of Maryland and was his third consecutive win inside the distance. Russell Jr. hopes to fight again in the fall, possibly against one of the other champions in an effort to establish himself as the best in the division. 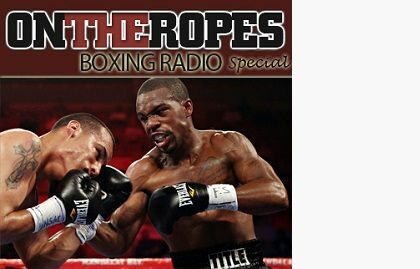 In part 1 of this “On The Ropes” boxing radio special interview with Gary Russell Jr, I discuss with him his recent win and get his thoughts on his position in the weight class. Russell Jr. also talks about his power surge in recent fights and why he thinks he’s scoring more knockouts. Additionally, Gary talks about the featherweight division and who he would like to fight next. Here is what Gary Russell Jr. had to say. Jenna J: You recently fought Oscar Escandon, can you talk a little bit about how you performed in the fight? Gary Russell Jr: Of course, I got a chance to study the footage of the fight and we executed the gameplan. He was very tough and very strong, he actually was one of the strongest punchers of anybody I’ve ever competed against in professional boxing. Jenna J: The fight was fun to watch, what do you think of the fan reception to the performance? Gary Russell Jr: I’m pleased that the fans and my friends enjoyed the performance and work that we did. I understand that we are in the entertainment business, it’s my job to entertain, so I’m glad that my fans love my skill set that I bring into the ring. Jenna J: One thing that has been very prevalent in your last fights are knockouts. People used to criticize you for it but now you’re knocking everybody out, what do you think was the turn that led to this? Gary Russell Jr: We had injuries earlier in my professional career. In the amateurs I was known as a good boxer/puncher, but I wasn’t able to show that particular attribute in the professionals the way that I wanted to, because of my hand injuries that had been occurring. We’ve been preserving my hands a lot better, I can punch with a lot more force and intensity now. That’s where it’s coming from. Jenna J: What do you want next in your career? Gary Russell Jr: I’m not sure what’s next for me, we have to talk to our team and work on our gameplan to try to figure some things out. Me personally, I would love to unify with any of the other world champions in the division. They are all great fighters, fan friendly fighters that I want to get the opportunity to compete against. I want to unify these titles. Jenna J: Your only loss is to Vasyl Lomachenko, now that he’s at 130lbs, do you want to move up or do you want to solidify all the belts in the division you’re currently in? Gary Russell Jr: I definitely would love to handle the division that I’m in right now. If we don’t get an opportunity to receive what we want, then I definitely plan on moving up. Regardless of how the plan might unfold, at the end of my career, me and Mr. Lomachenko will definitely meet again. Jenna J: There are a lot of interesting match ups at 126lbs, who would you like to see yourself face off against? Gary Russell Jr: That’s a good question. I would love to fight Leo Santa Cruz because we competed in the past, I stopped him from being able to compete in the Olympic trials. We were in the finals and I competed against Leo and he said he wanted the possibility to avenge the loss that I gave him in the amateurs. I would love to give him that opportunity, lets unify these titles. Jenna J: Boxing is doing really well right now, fans are getting the fights they want to see. How do you feel about the growth of boxing this year? Gary Russell Jr: A couple of months ago when you looked outside, there were no leaves on the tree, but they’re growing back now. They’re blossoming now, they’re getting bigger. The sport is definitely growing, you have a lot of talent in a lot of different divisions, it’s just our season and I’m ready to pick my harvest at the end of it. 1 Response to "Gary RusselI Jr: “I would love to fight Leo Santa Cruz because we competed in the past. Let’s unify these titles!”"
I really believe that Russell Jr will beat Loma in a rematch. It was a reasonably close fight and I think with this Power Gary has, that he can take Loma out!